In FileMaker Pro 10, FileMaker introduced OnTimer scripts which allow us to trigger a script to be run after a specified period of time. OnTimer scripts are great for implementing delays, timed refreshes and a whole host of possibilities yet to be discovered. However, one drawback that I have run into is that when the script runs, the user’s activities can be interrupted. At the very least, you will notice mouse pointer flashes, and worse, depending on the nature of the script, it could cause the user to be exited from a field or position on the layout. So, while I have found OnTimer scripts to be great for delaying script execution, or periodic status checks, I have not found it to be as useful in cases where continuous, dynamic interface updates are required. The multitasking capabilities in FileMaker Pro are limited in this way. 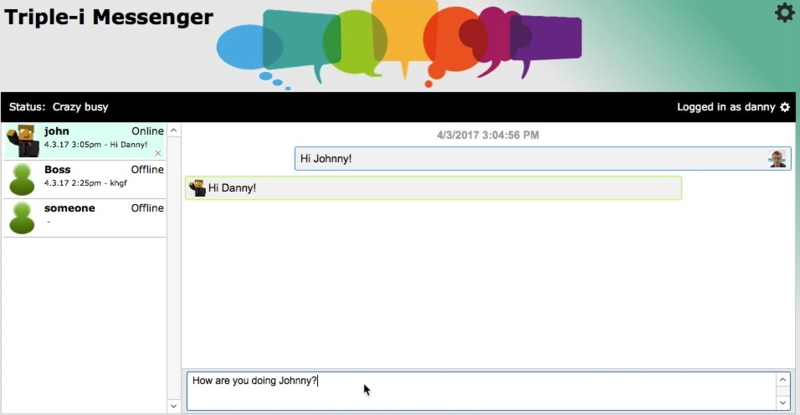 Web viewers, however, run in different threads, and when fed with data from your FileMaker Pro database, they allow us to create rich, up-to-the-second, content, complete with animation, sounds, popup alerts, or whatever else we want to put in there. And, the best part: it has no noticeable affect on FileMaker’s performance! This article covers a simple example of what can be done using Web Viewers, and it just scratches the surface of what can be done. For instance, I have also created an alarm clock as well as an interactive, internal instant messaging program with nothing but FileMaker Pro and web viewers: no plugins and no external internet access required. I’ll be discussing these in another article soon. Note: Feel free to skip right to The Countdown Timer Project section below if you are not interested in understanding the fundamentals of this process. You can make it work without a clear understanding, but if you wish to make enhancements or need to debug problems, you will want to read through this (BTW: if you are a subscriber to our free Inspired FileMaker Business e-newsletter, you may have already seen this). If you are interested in general information about the data URI, check out the Wikipedia Data URI article. With the data URI, we can build dynamic HTML content within FileMaker Pro using the calculation engine. 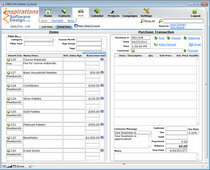 This allows us to easily include data from our FileMaker database within our HTML. In this step, we create a simple table in our FileMaker Pro database that stores our timer parameters. There are a number of ways this could be set up depending on how you want to use the timer. For instance, for this example, we will set it up so there is one timer per user. In this way, if a user closes the database and opens it again (whether on the same workstation or a different workstation), their countdown timer will persist. Alternatively, the timer could be workstation based, function based or session based. You may also choose to allow a user to run multiple timers at one time. __pk_TimerID – Number – Auto enter Serial. This is the primary key of the table. Though we don’t actually use this field for any relationships or other functionality, it is always good practice to include a primary key field in every table that you create. This way, if you ever need to isolate a record it in a relationship or script, you will have a way. _fk_User – Text. In my database, this is the id of a record in the User table that corresponds to the currently logged in user. However, if such a table does not exist in your database, it could simply be the account name of the currently logged in user. Label – Text. This field is optional and allows one to give the timer a label. For instance, if you want to remember to call someone in 1/2 hour, set the label to “Call Fred,” and when the timer goes off, it will flash, “Call Fred.” This is especially useful if you set it up to allow multiple simultaneous timers. Status – Text. This field will be used to flag the timer as “Acknowledged” so it stops flashing and beeping. You could simply use a number field as a flag (with values 1 or 0), but I like using the text field to allow for future expansion. Timestamp_End – Timestamp. This is the time that the timer will go off. This field will be set by a script that asks the user for a timer duration. It then simply adds the duration to the current time, and that will be the timestamp when the timer will go off. Duration – Number. For data entry. This field stores the number of minutes before the timer should go off. If no user table and current user occurrence exists, simply create a global field in one of your tables (preferably a Globals table) that gets set upon log in to the current account user name. Then create a relationship between that table and the Timer table using your global account name field = Timer::_fk_User field. Select "allow creation of records in this table via this relationship" to simplify the scripting process. Create a web viewer sized 115×40 (you can do any size, but the HTML code below is optimized for this size. This specifies the sound that will be used when the timer goes off. The file URL after the scr= statement is the path on a Macintosh workstation to the Glass.aiff sound effect file. If you are using Windows, this path will have to be adjusted. If you are in a mixed environment, you may want to use a sound file that is located on the web. Enhancement: You could paste this little web viewer to every layout in your solution. In this way, no matter what the user is doing, they will be able to see the timer and will be alerted when the timer goes off. You can adjust the font attributes in the body tag to make it fit. When the timer is idle, it will prompt the user for a timer duration and optional label, then start the timer. When the timer is running, it will ask the user if the timer should be stopped. If so, it stops and clears the timer. #If the timer is not running, prompt for timer settings and run timer. #If the timer is going off, set as “Acknowledged”. #Otherwise, the timer is running. Ask to stop it. Finally, define a button for the web viewer that calls the script you just created. That’s it. The timer should now work for you. If it doesn’t, take a look at the note on debugging below. In the next article, I’ll be talking about a similar, but slightly more complex project to create an alarm clock. This technique can be challenging to debug, because if something it not working correctly, the only indication you generally receive is an empty web viewer. 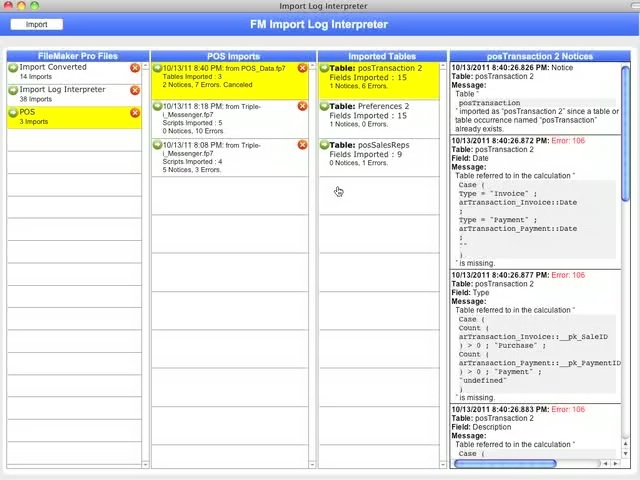 Note: The debugging technique I describe here uses features specific to FileMaker Pro Advanced (specifically, the data viewer). If you do not have FileMaker Pro Advanced, you will have to create a calculated field to achieve the same result (see alternative steps in parentheses below). Copy the contents of the “web address” field from the web viewer. Paste the code you copied from the web viewer into the calculation field. Inspect the contents, especially the var expressions to see that the FileMaker data is being captured properly. If you were not able to see any problems, copy the result into your clipboard. Open your web browser (I prefer FireFox, because I like the error log). Paste the result into your browser’s location field (the place you normally type web addresses). Then press enter. Open your browser’s error log. In FireFox, go to Tools->Error Log. In Safari, go to Window->Activity. In Internet Explorer, double click the little error icon in the status bar at the bottom. Hopefully, the errors reported by the browser will give you a clear enough indication of what went wrong. BTW: you may need to scroll all the way to the bottom of a long error log to see the most recent error. It will print hello world in the web viewer. This will bring up a dialog box displaying hello world. And of course, if you are still stuck or you have any questions or comments, feel free to post a comment below or contact me directly. This entry was written by Danny, posted on July 22, 2011 at 5:00 am, and filed under Relationships, Scripting, Web Viewers. Danny this is great stuff! I seem to be having an issue with the clock always displaying 0:00:00 even when I set the data right. Thanks for this great set of instructions Danny. I’m running into the same issue as Dimitris – everything appears to be set right but the Timer goes off immediately when the script runs, even though the Timestamp_End value is clearly in the future. I am wondering what’s happening with my file. When I click on the timer the window pop up showing enter time, I then click ok after the enter 30, nothing happens. I any idea what’s happening?